The three-quarter-scale wall includes the names of more than 58,000 service members killed or missing in action, including several Gardena residents. 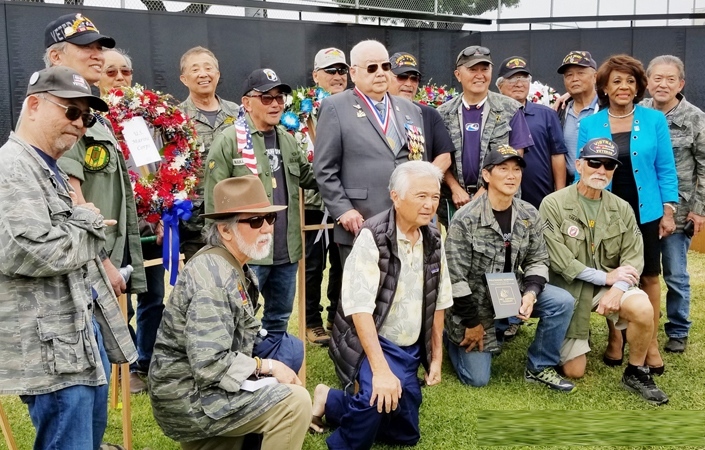 GARDENA — “The Wall That Heals,” a replica of the Vietnam Veterans Memorial in Washington, D.C., was displayed from April 4 to 8 in Gardena’s Mas Fukai Park. The park was open 24 hours a day for those who wished to pay their respects, including friends and relatives of some of the 58,318 service members killed or missing in action whose names are inscribed on the wall. 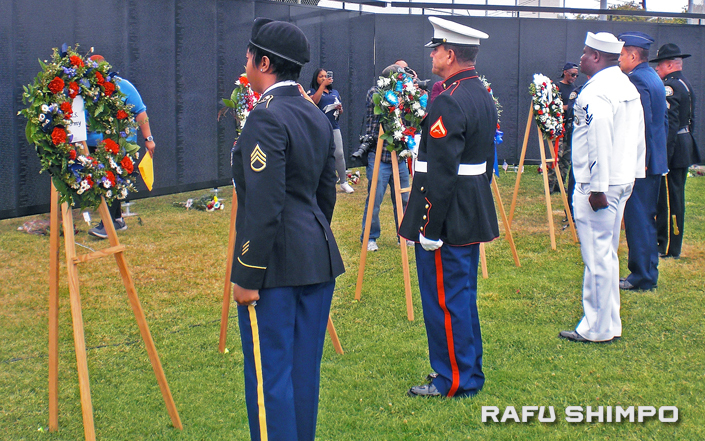 Gardena was one of only three California cities on the 2018 tour of the wall, organized by the Vietnam Veterans Memorial Fund. Of 132 organizations that applied for the tour, only 39 were accepted. The replica, which is three-fourths the size of the original, has been displayed in over 600 cities in the last 20 years. A “welcome home” ceremony was held April 7 with Los Angeles County Superior Court Judge Vincent Okamoto, a decorated Vietnam veteran and former Gardena city councilman, delivering the keynote address. Elected officials participating included Rep. Maxine Waters, State Sen. Steve Bradford, Assemblymember Al Muratsuchi, Gardena Mayor Tasha Cerda, and Carson Mayor Al Robles. Gardena Police Lt. Vince Osorio was the emcee. The invocation was given by Rev. Paul Nakamura of Gardena Nisei VFW Post 1961, who said, “Today we come in deep humility and thanksgiving to remember the men and women of great valor who served in Vietnam in a most difficult time, like it is today, to a faraway country little known by us then. The men and women of valor trudged through deep forests, open rice fields and villages, always open to threats, firepower and snipers hidden in trees and bushes. Yet they tended to the wounded, their own or even the enemy at times. Rev. Paul Nakamura chats with the Emerald Society pipers and drummers. “Vietnam was one of America’s longest and most controversial wars. For almost a decade, America involved itself in Vietnam, and that involvement divided this country like nothing since our own Civil War. Contentious arguments on the necessity and morality of the war destroyed friendships, pitted father against son, saw student demonstrations shut down colleges and universities, engendered bitter debates in the halls of Congress and often led to violence and bloody riots in the streets. “Every night, the 6 o’clock news brought bloody images of the fighting in Vietnam into the living rooms of America. The war seemed like an interminable, unstoppable program dragging on year after year, like some horrible plague that the government was unwilling or unable to solve. Over time, many Americans, frustrated and angry over the seemingly endless war in Southeast Asia, began unfairly to blame the war on the warriors. Photos and flowers were placed near the names of loved ones on the wall. “But beginning in the late ’70s, a small core group of Vietnam veterans came together and decided if the country failed to remember and honor their comrades, those who died in Vietnam, then they would do so on their own. That core group reached out to other Vietnam veterans and their families, and in 1978 began a national fundraising campaign to erect a memorial honoring their war dead. Within four years, without any government funding, they raised over $9 million. “A dozen design proposals were reviewed before selecting one submitted by Maya Lin, a 20-year-old Asian American architectural student at Yale University. It was a unique concept, elegant in its simplicity. 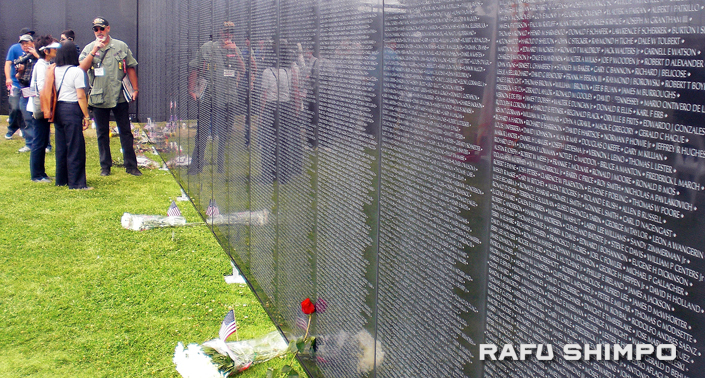 A memorial wall composed of 70 black granite panels is inscribed with the names of over the 58,200 Americans who died in the Vietnam War and those who were listed as missing in action. 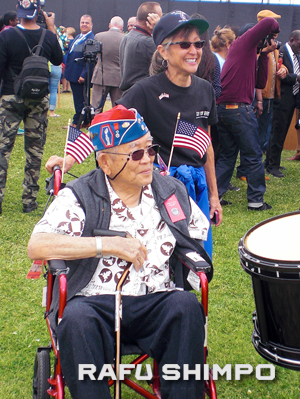 World War II veteran Don Seki and his daughter Tracey Matsuyama attended the ceremony. 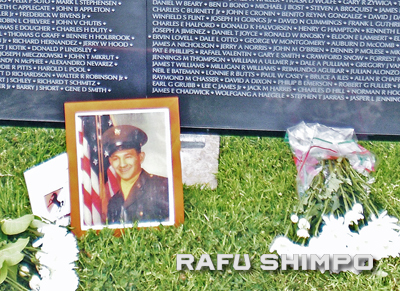 “On Nov. 12, 1982, the Vietnam Veterans Memorial was dedicated in Washington, D.C. I was present at that dedication along with 30,000 other veterans, their families and loved ones … Many battle-hardened veterans unashamedly cried as they looked upon the wall. Those veterans reached out and touched the names of their friends who had died. They shook hands and embraced, saying, ‘Welcome home,’ the greeting that was denied them when they returned from Vietnam … On the polished granite surface, they see a reflection of themselves staring back at them, as if they too are embedded in the wall and are once again united with their fallen comrades. “It’s important to remember that unwritten alongside each of those 58,200-plus names are the names of mothers and fathers, wives and sweethearts whose lives were shattered by the death of their loved ones. Since its dedication in 1982, the wall has become one of the most visited memorials in Washington. It provides a place where parents … and sweethearts can come and commune with those who died, to think about what was and what might have been. Wreaths were placed by members of the five branches of the U.S. Armed Forces: SSG Monica Funes of the Army, Sgt. Erick Ojeda of the Marine Corps, Petty Officer Godson Bagnabana of the Navy, Lt. Col. Tim Yoshinaga of the Air Force, and Honor Guard Sgt. Rodney Gonsalves of the Coast Guard. Assemblymember Muratsuchi recalled, “I was just a 10-year-old boy when the Vietnam War ended, so I don’t have a lot of memories of all the conflict and divisiveness that our nation went through. But I did have my own perspective because I was a military brat. My father worked for the United States Army for over 30 years, so I grew up on military bases at the time … in Okinawa, bases like Camp Buckner, Kadena Air Base … one of the stopping a areas common for Vietnam war veterans. 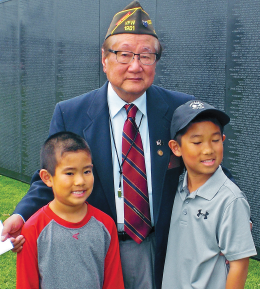 VFW Nisei Post 1961 Commander Steve Moriyama with grandsons Danny, 8, and Robbie, 10. Steve Moriyama, commander of Gardena Nisei VFW Post 1961, thanked the Vietnam Veterans Memorial Fund and all of the volunteers who helped, including local veterans, gold-star families, City of Gardena staff, the Gardena Police Department, and members of the Junior ROTC at Gardena, Redondo Union and North high schools. “Without the dedication, the hard work of everyone, this event would not have been so wonderful,” he said. 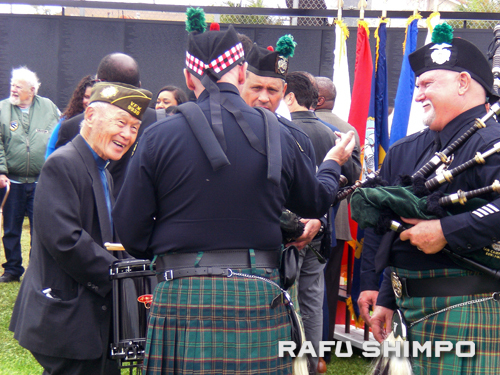 With the LAPD Emerald Society Pipes and Drums playing a medley of military songs, wreaths were placed by members of the major branches of the U.S. Armed Forces, including Lt. Col. Tim Yoshinaga for the Air Force.